Instruction in other languages: French, Spanish, Dutch, Italian, Norwegian, Swedish, Finnish and Danish will be available for download soon. The box contains 3 stacks of cards: 2 beige (A, B) and one (C) that is comprised of other color cards. You can store this manual underneath cards’ spacer (D) if needed. Green and orange cards (C) need to be separated into 6 stacks according to their icons and put on mini shelves (E, F) - as shown below. During the game players draw beige cards frist from stack (B) and then (A). Spent cards are put face up in stack (C) and then (B) when it’s empty. This configuration let’s you keep all cards in the box during the game (except players cards which are held in hands or on a table). 1. 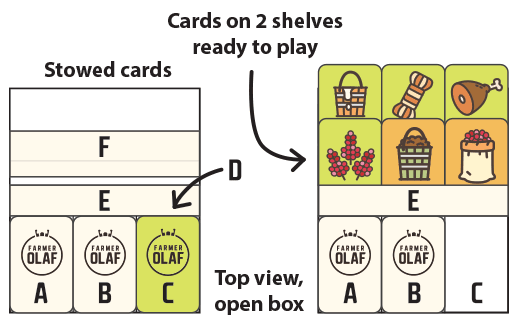 Separate green and orange cards (wool, ham, milk, quinoa, forage and manure) into 6 stacks face up according to ‘How to use the box’ instructions. You can check card names and quantities on the page 2. 2. Give players mini cheat sheet cards if needed. 3. Take 4 cards from beige stack: a boar pen, a valley, a field and a yakshed (see page 15). Those cards will be drawn when starting the game in step 8. 4. For a 2 player game also put away 6 beige cards to a spent cards stack (C): a field, a meadow, a yak shed, a boar pen, a yak and an alpaca. 5. Shuffle rest of beige cards thoroughly and put them into two stacks face down (A, B). 6. The aim of the game is to collect points from green cards, which players receive for performing certain agricultural actions. 7. Each green card is worth 3 points except milk which is worth 2 points. 8. Players start the game by drawing one card from 4 beige cards stack prepared earlier on (a yak shed, a boar pen, a valley and a field). Not drawn cards are put away on the spent cards stack (C). 9. In the first turn each player receives 4 beige cards from the stack (B). 10. In subsequent turns each player draws 1 beige card from the stack (B) and when it’s empty from the stack (A). 11. If player draws one of a trader beige card, he announces the event, immediately puts this card away (C) and draws another beige card. 12. When a trader card is drawn, every player can exchange in the same turn an animal matching the one in the trader card for a new beige card. 13. When you draw a two-sided beige card (indicated by two small icons on the opposite corners), the starting side is marked in the upper-left corner as follows: a field, a boarpen, a yak shed and a shaved alpaca. 14. When performing an action with a two-sided card (an alpaca, a field, a yak shed or a boar pen) you turn it upside down, so the new icon is visible in the top-left corner. 15. The actions cheat sheet is on the last page and on 4 mini cards. Icons on the left are cards that you need to perform an action, and on the right are cards that you are left with after performing an action. When performing an action you spend some cards and collect others from the box. 16. A tractor can exchange 2 workers when sowing the field. Similarly a harvester can exchange 2 workers when harvesting the field. 17. When you perform an action of cleaning a boar pen, apart from a green point card you can choose whether to collect a manure or a new beige card from the stack. 18. Orange and green cards can be obtained only when performing certain actions (shown in the cheat sheet and 4 mini cards). 19. Orange forage can be used in actions just as the beige one. 20. Actions - only one action per turn can be performed by each player except last turn when 2 actions per player are allowed. 21. Trade - players can trade anytime during the game including lending / borrowing cards and paying with cards in the future. All players involved in the trade have to agree on the conditions and have to honor the deal. 22. When all beige cards are drawn and all actions are performed, each player counts their points. The one with the most points wins and receives an award from Farmer Olaf. For examples and movie how to play see 'How to play'. If you are interested D-I-Y add-ons and modifications of rules you can visit Mods and add-ons'. If you have any suggestions or questions you can visit BGG forum or ask me directly on a Discord server. 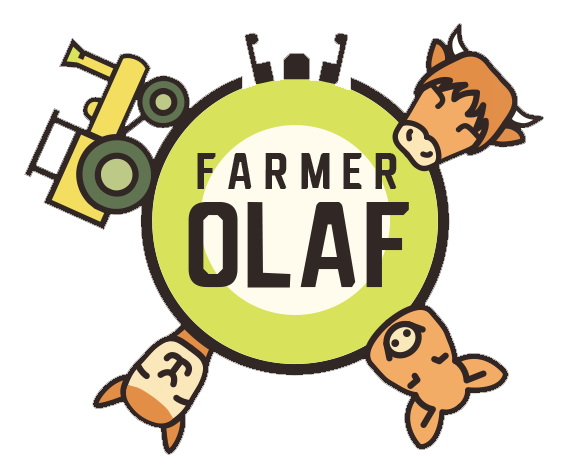 I post all news related to Farmer Olaf on Facebook.